Dotted Stripe Printed Tunic is rated 4.4 out of 5 by 8. 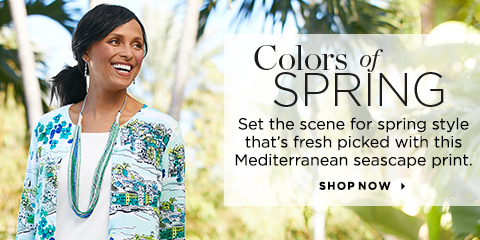 A mix of colorful patterns and a layered asymmetrical hem lend trendy details to this woven v-neck tunic top. Rated 5 out of 5 by Sunnydays from My favorite top I had looked at this top for a long time, got it at a great price. Fits perfect, so comfortable and flattering! Rated 2 out of 5 by Rhoda123 from Double Hem I didn't like the double, angled hem. Looked odd to me when I tried it on. I liked the colors of it though. Rated 3 out of 5 by BRedington from Meant for Slender Figure The color and fabric were perfect but the fit was not. I purchased size X (14) which typically fits fine but the bottom of this tunic was too tight to fall naturally. I returned it, very disappointed. Rated 5 out of 5 by Kraken from Soft and comfortable I love this top, it’s soft and Very light weight, goood for hot summer days. Launders so easy and always looks fresh and pretty. Rated 5 out of 5 by TrishP from Great Tunic LOVE it. It will be perfect for our upcoming trip to Florida - not very fitting for our -26 degree weather in Wisconsin today. Rated 5 out of 5 by Head Rabbit from Fits great around the waist! Even though it is double fabric it allows for movement around the waist and hangs straight. Rated 5 out of 5 by Lil 10 from Good printer I haven't worn this top yet. Not warm enough to wear sleeveless.